Abstract: In many scenarios, graphs and networks only capture the (often static) “infrastructure” of applications. What really interesting is the dynamics, that is, the activities on such graphs and networks. Take influential maximization as an example, a well recognized core problem in many applications like viral marketing. In many contexts, such as personalized viral marketing, cold-start recommender systems, time-sensitive message spreading in social media (e.g., WeChat and Whatsapp), the influence spreading dynamics are of critical business values. At the same time, in many contexts the problem remains unsolved and challenging. In this talk, I will review some of our latest development in investigating dynamics and evolution in graphs and networks. I will present in detail a general continuous influence maximization model, and also briefly highlight an activity maximized influence maximization model and an online influence node monitoring approach. 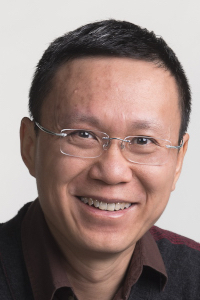 Bio: Jian Pei is currently the Canada Research Chair in Big Data Science, a professor in the School of Computing Science and an associate member in the Department of Statistics and Actuarial Science and Faculty of Health Sciences at Simon Fraser University, Canada. His expertise is in developing business driven, technology enabled data analytics for critical applications. His publications have been cited by more than 65,000 in literature, and by more than 30,000 since 2012. He has an h-index of 72. He is also active in providing consulting service to industry and transferring his research outcome to industry and applications. His leadership in creating industry relationship was highlighted by national news media. During his current sabbatical leave, he is acting as the Chief Data Scientist of Huawei Central Software Institute and is responsible for the development of the AI platform at Huawei. He is an editor of several esteemed journals in his areas and a passionate organizer of the premier academic conferences defining the frontiers of the areas. He received a few prestigious awards, including the 2014 IEEE ICDM Research Contributions Award and the 2015 ACM SIGKDD Service Award. He is a fellow of both ACM and IEEE.